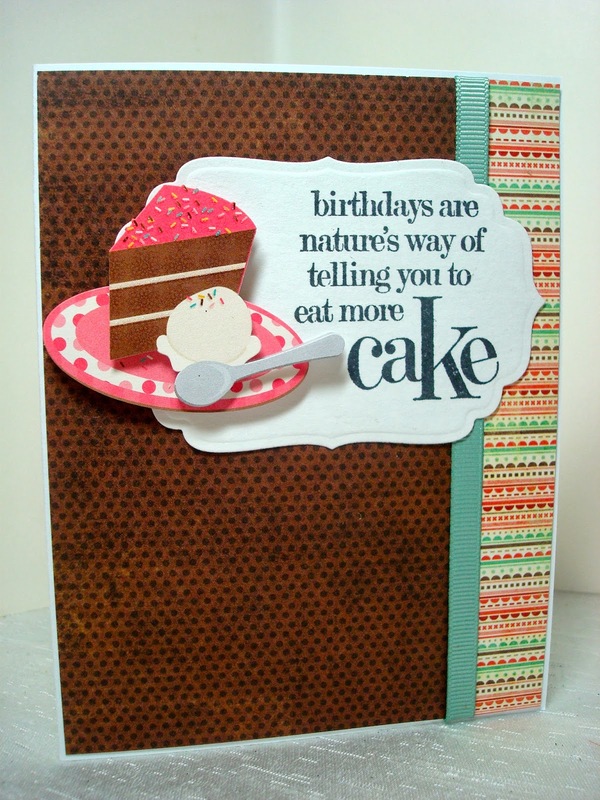 Amy's Creative Pursuits: Eat More Cake! Hello! I love cakes? Don't you? I really dislike the new trend of NOT having a cake at the graduation party or a wedding. That was always my favorite part of any life event party: seeing a beautifully, decorated cake and eating it! But now to save money, the trend at most parties seems to be a 'dessert bar'. Not for me. Sorry. Give me a good old fashioned piece of cake! Because of my love for cake, when I saw this sentiment I had to buy it. It's so funny, isn't it? I simply stamped it onto a panel made with a Nestie, and added a three dimensional sticker from K & Co. Here's a close up of the cute sticker. I used a darker dp so that I could give this card to a male or a female. I put a more colorful strip of dp on the edge, and added just a simple strip of ribbon for embellishment. Hmmm delicious :-)) Superb card Amy, the sentiment is nice ! That is a fun sentiment and love the 3D effects of the image/sticker. Nice sketch too. Delightful and fun card, wonderful way to say Happy Birthday!